I am always fascinated by people who put fake, read “FAUX”- animals in their yards. It is one thing to do it as part of your business such as a life size horse in front of a riding center and quite another to plop them down in your own front yard. I wrote about this once before because I find it so fascinating. Do they think we will think they are real? Are they just funning us? Or does the plastic replica of a deer or cow really make them feel one with nature. I can’t figure it out. It is not as if you see these faux animals in the big city where the real version would be hard to come by and so they need a little reminder. No, these faux animals are usually in rural areas where the real animals actually live, sometimes just down the street. So what gives? 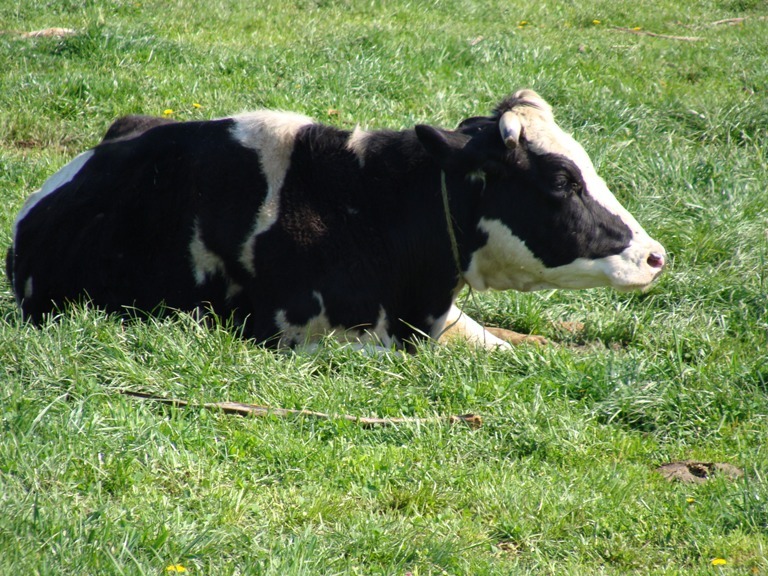 So it should come as no surprise that when I was driving down the street and saw this Holstein in this parking lot that my car came to a screeching halt. I thought I was in Faux Farm animal heaven. This cow is truly the mother of all faux animals. I wanted to set up some candles, flowers and bales of hay as a little shrine except for the fact that it was the Mennonite School parking lot and I am sure it was not only a drug free zone but also a pagan free zone. It was all I could do not to hook that trailer up to my SUV and drive away, except that I don’t have a hitch and I think I might have never made it under the train bridge a mile up the road. 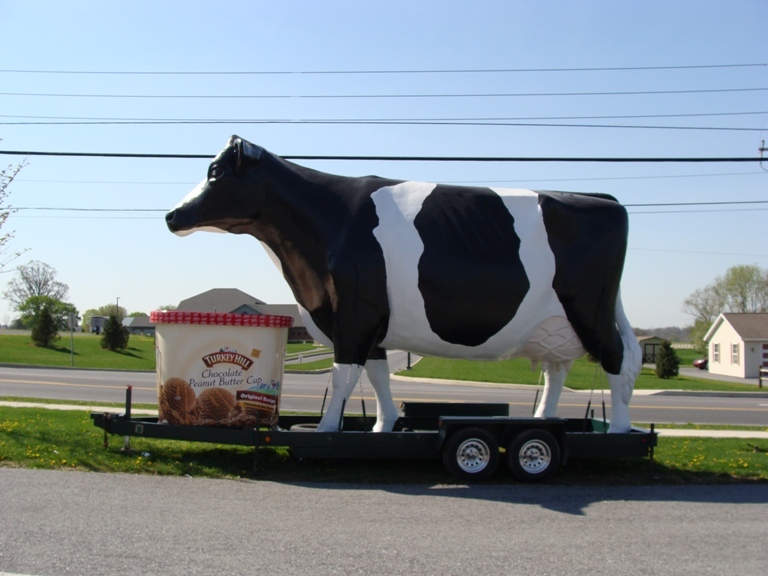 How horrible would that be – caught for not only stealing the giant cow but then beheading it. 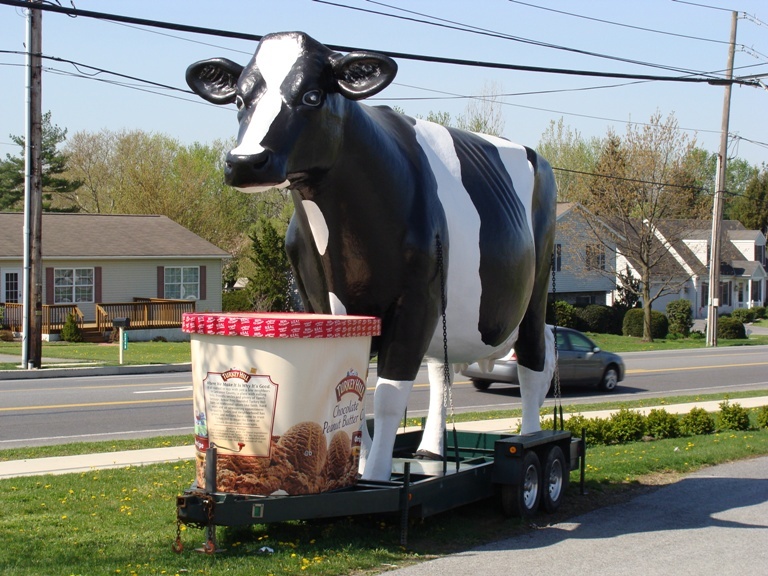 The people at Turkey Hill would have been soo mad if they lost their precious giant cow. 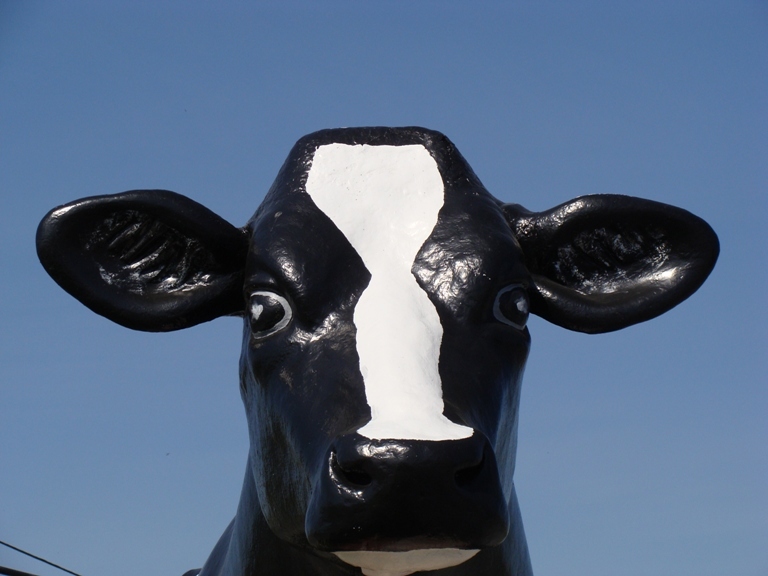 Or maybe not so much- because about 5 miles down the road at the New Holland Recreation Center was this cow’s twin. Turns out they have 3 cows and a web page all about them. And one did get stuck under an overpass on Interstate 95, now that had to be quite a sight. They also send them out to birthday parties and you can sign up for the monthly contest to see if you get picked. Yes, I signed myself up cause, well I couldn’t NOT do it, now could I?